Day 75 and 76 – One week to go! Somehow my second half marathon is now only one week away? How did that happen? Yesterday was a rest day – just an early morning trip to the gym to continue the quest to strengthen my hip and glutes. The weather was so nice – 73F and sunny when we got home. So we did what any normal person would do – we got out our grill for its first cooking adventure of the year. 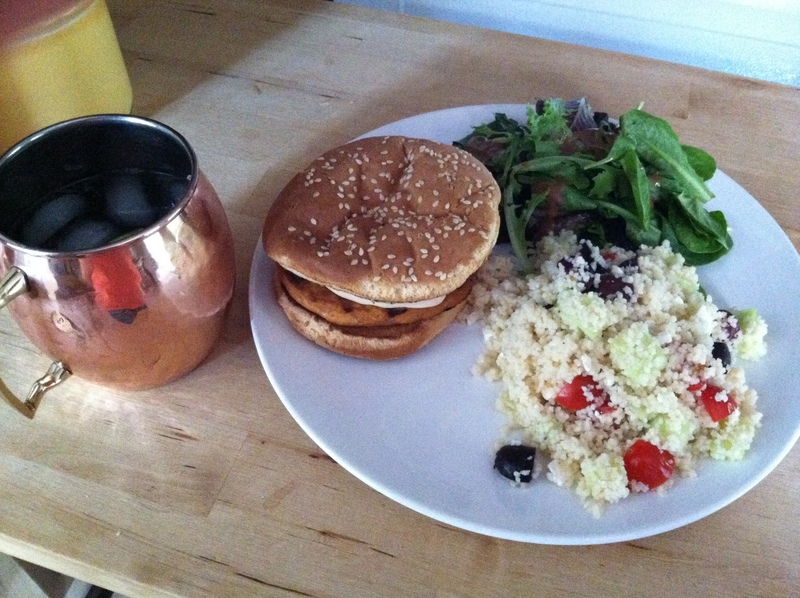 We had some Costco salmon burgers in the freezer (would definitely recommend) and had them with a Greek-inspired couscous salad. And the obligatory cocktail in our snazzy copper mugs. We even ate outside! This weekend I had my last (!) long run of this training plan – 9 miles during which I really wanted to nail down my fueling plan. I also wanted to push it a little to see if my goal time was going to be feasible at all. Because the weather looks like it’ll break tonight and we have an excursion planned to a new brewery – today looked like the day to get ‘er done. 9.1 miles at 8.04 min/mile pace. Gu gel (chocolate shock – I like my gels to taste like dessert) at mile 5.5 and a comfortable but still challenging pace. Finished strong (and downhill) and for the first time after a long run (which for me is 8+) I felt refreshed and ready for more. I think this race is really going to happen for me. I had been a bit hesitant to even think about a PR – this course is a little more challenging and with all my injuries (sciatic nerve, hip bursitis, strained gluteus medium, runner’s knee) I thought getting to the start line healthy and maybe running a sub 1.50 would be an achievement in itself. But now my competitive nature is wondering if a PR might be on the cards……. 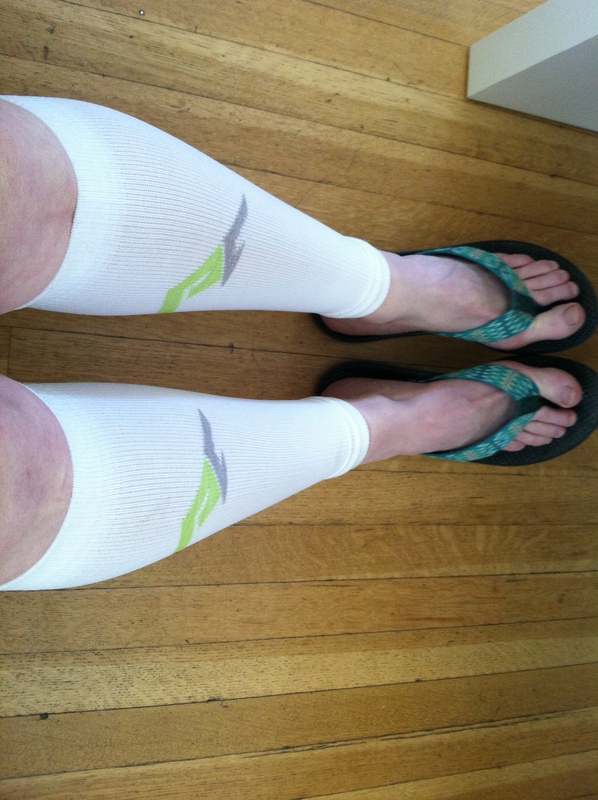 As usual my long run was followed by a smoothie, and an egg and avocado toasted sandwich. 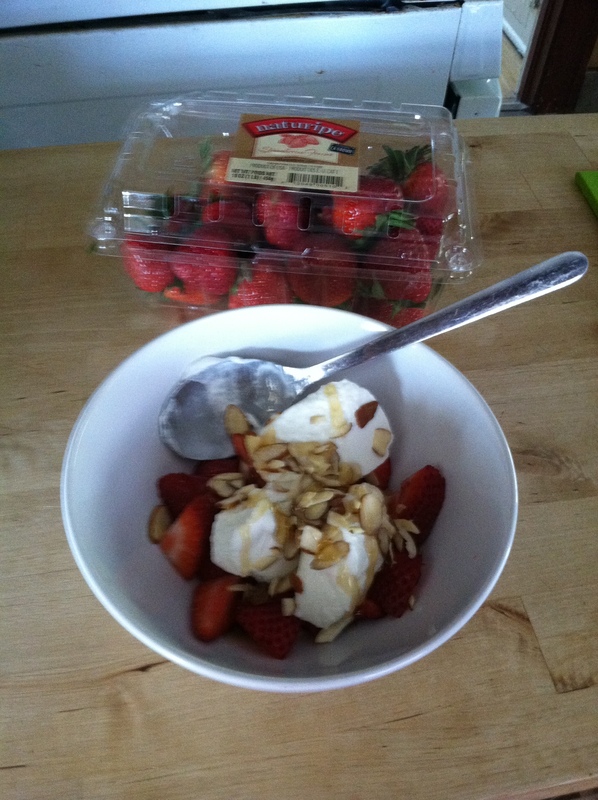 We also got some strawberries on sale – Greek yoghurt, honey and almonds. Is this dessert or breakfast? Whatever, it was awesome.